Lisa Vanderpump Does West L.A... Substance Over Hype? Pump in West Hollywood has now been open since May, 2014. 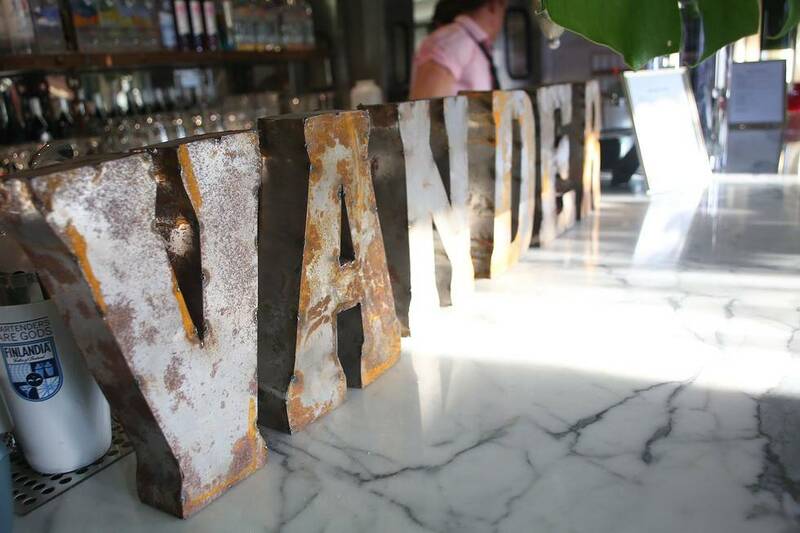 Due to the hype surrounding its initial opening, and the celebrity of its owner, reality television star, Lisa Vanderpump, reservations were nearly impossible to get. Now that things have settled down a bit and although they are "a must" on weekends as well as for the the "Gay Sunday Brunch," access is now somewhat attainable. One of the major things that makes Pump unique, even for Los Angeles, is its interior, which is dominated by nine large olive trees imported at great cost from Northern California. This was a design panache that did not come cheap. The installation of an underground irrigation system, as well as regular visits from an expert for mold and other tree-related diseases is required to maintain this unique design aesthetic. Since I arrived at Pump fairly early on a weekday night, the Chef, Penny Davidi, was able to sit down with me, which in an L.A. hotspot such as this, is a rarity. However, her eight person brigade was well organized enough that she was able to explain every dish, most of which were extremely original. The team at Pump is as you may expect from an L.A. hotspot are all extremely attractive, buff and anatomically correct, would-be actors, who no doubt love to interplay with the Hollywood directors and producers who frequent this perfectly trendy hotspot. It was hardly surprising that the women servers at Pump seemed to be relegated to the bar area at the rear of the restaurant--but enough about the place, what is the food like ? Without even bothering to check out what Yelp has to say, Pump gets a thumbs up from me, as it tasted just as good the next day! I started out with their signature dish, Fresh Papaya w/Shrimp & Crab ($18), a rather unique combination that is tossed with chives and heirloom tomatoes in a light aioli and dusted with Spanish paprika and pistachios. The presentation was compelling and featured the seafood nestled comfortably in the middle of the freshly-halved papaya--appealing and delicious! The Mediterranean Board ($18), delivered a delicious array of hummus topped with pine nuts, as well as a host of other goodies including olive tapenade, creamy feta cheese, peppers, olives and artisan bread. The menu also includes a few other salads that look mighty appealing - especially the Roasted Beets & Goat Cheese Napoleon and Tiger Prawn & Farro. Speaking of farro (a grain most commonly of Italian origin), this chef is a big fan of this ingredient and also used it as a base for the Pan Seared Pacific Sole ($26) which was a welcome departure from the usual haricots verts and baby rosemary potatoes. Sticking with the fish theme I also felt compelled to try the Vanderpump Fish & Chips ($25) served with malt vinegar and ketchup on the side. The fish was excellent, lightly battered and the thick cut country fries were nice and crisp, just as they should be--coming from a Brit, a compliment for sure. Pump is a restaurant that seemingly caters to the upper-income gay and lesbian crowd and although the pomp and circumstance brings the price point above the fray, is still well worth the visit, and food will certainlybring you back for more.